In this section, attention turns to grades 6-8 to suggest content to address SHAPE America’s Grade-Level Outcomes for middle school. Again, the relative emphasis for Standard 2 at the middle school level is discussed, and ideas on assessment are provided. Although effective class management (chapter 12) is essential, and you should cultivate a range of teaching styles, you need more than just varied teaching styles to ensure that learning takes place. Effective teaching for learning in physical education requires you to use a particular set of skills and teaching behaviors after you have your learning environment organized. Now more than ever, physical education is a critically important school subject for reasons related to its contribution to children’s overall physical and psychological well-being and for the contribution it can make to the intellectual growth of children. The Essentials of Teaching Physical Education is the most up-to-date resource that aligns with SHAPE America's National Standards and Grade-Level Outcomes for K-12 Physical Education. The text is comprehensive in its coverage of what future teachers need to know about teaching K-12 physical education and offers a flexible, individualized approach to enhancing student learning and acquisition of skills. 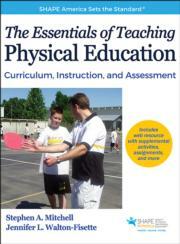 In addition, The Essentials of Teaching Physical Education offers a practical and highly successful teaching for learning approach to curriculum development, which makes it easy to put the contents of the book into action and prepare students to graduate with a high degree of physical literacy. The book’s focus on physical literacy, accountability, and social justice—all key elements to high-quality physical education—will prepare future teachers to step into their jobs on day one, ready to deliver an effective program. The text also supplies a vocabulary of the current terminology used in physical education. The result is a practical and well-researched resource that will help current and future physical educators develop physically literate students while providing guidance for accountability and social justice and meeting SHAPE America's National Standards and Grade-Level Outcomes for K-12 Physical Education. And that makes it a win–win–win: a win for teachers and future teachers, a win for their students, and a win for the United States as it progresses toward becoming a healthier nation.